An important part of managing your business is knowing what customers need to pay you and what bills you need to pay. The reports you need to do this are called Unpaid Invoices and Unpaid Bills. You can find them in the Reports section of the menu. 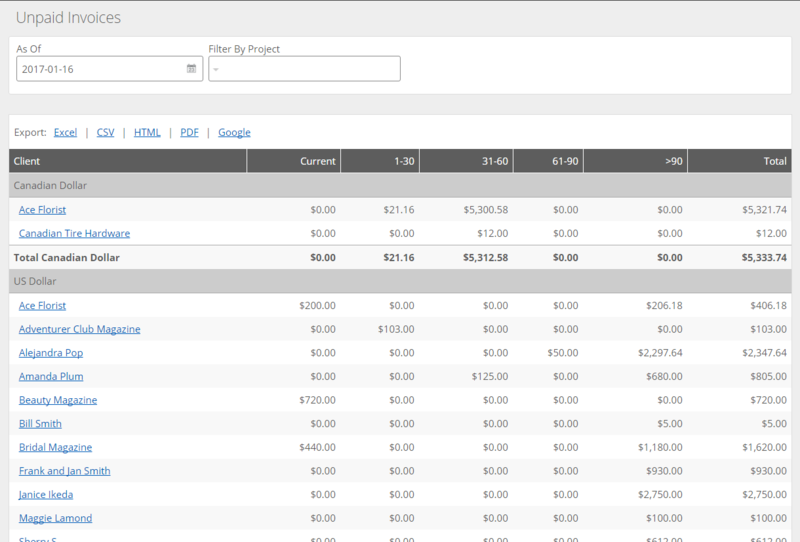 It shows you all the outstanding client invoices (accounts receivable) at a certain point in time. In the above report, it is As Of 2017-01-16. Using the report you can not only find out how much is owed to you, but also how long it's been owed to you. 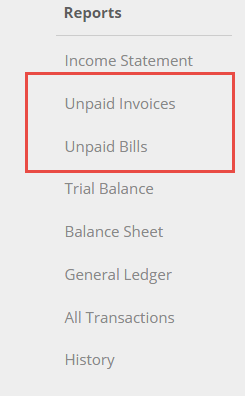 Any invoice in the Current column is still in good standing as of the As Of date. The other columns represent invoices that are overdue by 1-30 days, 31-60 days, 61-90 days, and more than 90 days. The Unpaid Bills report acts in the exact same fashion as the Unpaid Invoices report, except it displays outstanding supplier bills. As the financial manager for your small business, you will want to regularly generate aging reports. It is good business practice to both review and utilize your aging reports to maximize your cash flow by getting paid on time and paying your bills on time.